It’s about time to get these National League predictions out to the public; after all, there is baseball in Miami’s new palace on Wednesday night. The NL has had quite a few changes in the offseason….superstars on different teams, new managers and plenty of phenomenal young talent. The defending Champion St. Louis Cardinals will have a much different look with Tony La Russa retired and Albert Pujols hitting lasers in the City of Angels. So, without further a due, here we go. Miami Marlins – Ozzie Guillen is at the helm for the Fish so buckle your seatbelts. 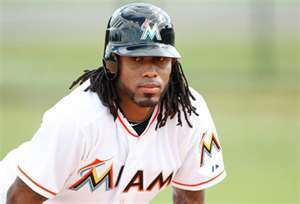 The speed and power combination Miami has may not be rivaled in the NL. The healthy return of Josh Johnson is imperative to the Marlins success. If he doesn’t have a good year, they finish behind Atlanta and Philadelphia. I’m very interested to see what kind of fan support there will be for the new-look Marlins. Atlanta Braves – It’s the last go-round for Chipper Jones. He’s probably a first-ballot hall-of-famer, but how many games will he actually play this year? The Braves have a lot of young talent and they’ll need to erase last year’s late-season collapse from their memory. The backend of the bullpen in Johnny Venters and Craig Kimbrel is dominant. Philadelphia Phillies – As good as the Phillies pitching staff is, the holes in the lineup are way too big to ignore. Losing Ryan Howard and Chase Utley, for however long, is simply too much firepower to lose. Washington – Washington is improving tremendously every year but I believe they’re still a year or two away. To see them finish higher than fourth would not surprise me in the least. The pitching is there, but the young lineup will need to continue to improve. New York Mets – The Mets are in disarray. Even their best player, David Wright has question marks. Can he stay healthy? Not much else to say about the Mets as they start the rebuilding phase. Milwaukee Brewers – Call it a homer pick, call it what you want to call it but I believe the Brewers will repeat as NL Central Champions. Yes, they lose a huge bat in Prince Fielder. Mat Gamel is essential in picking up the slack. He won’t duplicate what Fielder did in Milwaukee but he isn’t expected to do so. Like last year, the pitching will carry this team. Zack Greinke is primed for a big year. Cincinnati – The Reds have a very good lineup and I would have picked them to win the Central if Ryan Madson was around. Losing him is huge. A once very strong bullpen is now in a bit of disarray. Joey Votto, Jay Bruce and Brandon Phillips are a tough trio. St. Louis – Yes, I’m picking the defending Champs to finish 3rd. Another injury has dampened my thoughts on this team and that is Chris Carpenter. 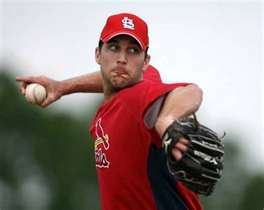 Adam Wainwright has to bounce back from Tommy John and be the pitcher he was before the injury. Take out Tony La Russa from the mix as well. Pittsburgh Pirates – It has been 19 straight losing seasons for the Pirates and I think they make it 20 this year. Getting close, but I think they finish in the 76-80 win range. If Pedro Alvarez can be what the Pirates need and expect him to be, that .500 mark might become a reality. Chicago Cubs – The Cubs begin the transition phase of the new regime led by President Theo Epstein and General Manager Jed Hoyer. Just too many big contracts that are just about impossible to move. The pitching staff isn’t exactly one to be desired either. Houston Astros – Not a whole lot to say about the ‘Stros other than they might lose 120 games. That’s not a misprint either…1-2-0. 1. San Francisco – The offense improves in 2012 and the pitching staff will once again be one of the best in the Majors. Tim Lincecum, Matt Cain and Madison Bumgarner are scary good. 2. Arizona Diamondbacks – Can easily see these two teams switching spots and I expect both to be in the playoffs. The D-Backs have a solid lineup top to bottom and have Ian Kennedy, Daniel Hudson and Trevor Cahill to fall back on. 3. L.A. Dodgers – The Dodgers have possibly the best two players in the league in Matt Kemp and Clayton Kershaw but those two need help. Dee Gordon is going to be a very good player in the near future but there are some holes in their lineup. 4. Colorado Rockies – Troy Tulowitzki and Carlos Gonzalez once again anchor the Rockies lineup but there isn’t a whole lot on the mound. Might be a struggle for Colorado in 2012. 5. San Diego Padres – There are few bright spots in San Diego other than some young players who are years away. Yonder Alonso and Cory Luebke are the new faces of the franchise…ready or not. Now on to the Awards…. Starlin Castro has to be in your rising star for the NL central.